Wow! As I process this story, I fall more in love with the characters, if that is even possible. I loved the strength and determination that Natalie displayed while being in the worst situation ever; stuck between two loves and two very different kinds of love. If you read Consolation, you’re well aware of the cliffhanger that Corinne left us with. Which team you’re on doesn't matter. What matters is Natalie and Aara’s happiness. This is Natalie’s journey. Her story about figuring out what she wants from life and having the courage to fight for it. I finished Consolation being #TeamLiam but as I read Conviction I became #TeamEveryone. I wanted everyone to have their ‘happily ever after’. My heart broke for every single one of them. Aaron is a good guy who was dealt a crappy hand. He’s suffered more than we know. He did make some horrible decisions. That being said, I want him to be happy. He deserves it. Liam was just figuring out that having a family was what he wanted in life when Aaron returned. Liam finds himself being torn between the love of his life and his best friend and brother in arms. Natalie just pieced herself back together from the loss of her first love, opened herself to the possibility of loving someone else. Now she needs to relive the heartbreak and the lies a second time around. I loved this book, I couldn't put it down. I can’t remember the last time that I finished a book and felt content where each character was left. 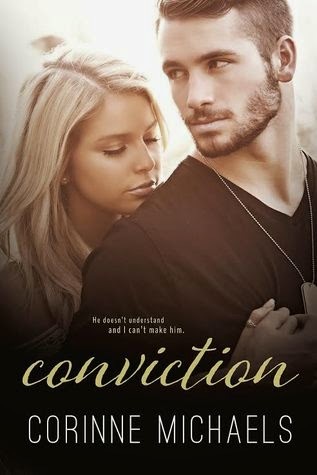 Make sure you read Consolation and Conviction also, if you haven’t read Beloved and Beholden, Jackson and Catherine's story, do so. You won’t regret it. Awesome review! Have to read this!